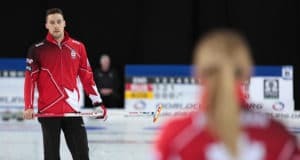 The Tim Hortons Roar Of The Rings has been billed the biggest, the best, the most pressure-dripping curling show in at least four years. So why is it that the 32 curlers involved at the women’s level appear to be so footloose and fancy free? During practice sessions at Rexall Place on Saturday, there wasn’t a smidgen of evidence that this event carried any more import than your basic weekend cashspiel. And no evidence, either, of impending tight collars or stretched knickers. “I think all the work and pressure getting here has burned out some teams, a lot went into it, and now they’re just relaxed and probably saying, ‘OK, let’s have a little fun now’,” allowed Calgary’s Cheryl Bernard, one of four so-called top seeds in the women’s Olympic trials. Bernard takes on Krista McCarville of Thunder Bay in one of four first-round matches at 1 p.m. Sunday. Neither team could be construed as a favorite. 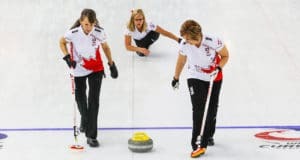 Not with the likes of former world champions Jennifer Jones of Winnipeg and Kelly Scott of Kelowna, and defending Trials winner and Olympic bronze medallist Shannon Kleibrink of Calgary in the lists. But you might expect these two, among others in the field, to be feeling slightly less pressure. Bernard arrived in Edmonton after spending a week relaxing in the relatively temperate climes of San Diego. There’s no doubt, though, that the eight-team field that also includes Saskatoon’s Stefanie Lawton, Calgary’s Crystal Webster and Kronau, Saskatchewan’s Amber Holland is about as redoubtable as you’ll find anywhere. In other Sunday openers, Kleibrink tackles Webster, Jones plays Holland and Lawton goes against Scott. Holland, skipping another darkhorse in Saskatchewan green, shrugged as she gave her assessment of the task ahead. The Rex represents the largest icehouse into which Holland has set curling footwear. That fact is assured. 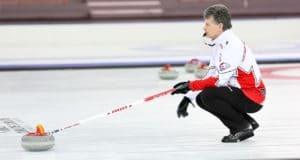 The Tim Hortons trials will have the distinction of being curling’s highest revenue-grossing event of all time, made possible by the most aggressive ticket pricing in the sport’s history. Kleibrink discounts any theory her Olympians have a ghost of an advantage in this fracas. At Halifax in 2005, Kleibrink lost three of her first four games, then won seven straight in a 10-team affair. Defending Canadian champion Jones, too, agreed early matches were more vital that they might be in a tournament involving more teams. “You can’t lose many games if you want to stay in it,” she said. “But, just like any other event, as long as you get to the playoffs that’s really all you’re looking for. Obviously, this is a high-calibre field. All the top teams are here and you’re going to have to play really well to beat them. There’s great respect among the teams and we all know we’re going to have to play well and get on a bit of a roll. “We’re better prepared, a more seasoned team, and we realize the significance of this a lot more now,” she said. “I don’t think there’s anything more we could have done back home to get us ready for this week. Webster, a rookie at this level, admitted she expected to be nervous. Previous: Hey Coach: CurlBook – Your One Handed Curling Stats Application!